Posted August 27, 2010 9:39 am & filed under News, Science. I’ve been blogging a lot recently about the fruit of the cactus. The cactus fruit! Tunas and Dragonfruits etc. Now the domesticated desert pitaya, from Stenocereus pruinosus, has been tracked back to original populations in the wild. “What we found is that the people of the Tehuacan Valley are carefully selecting and cultivating cacti to produce the pitaya they want,” says Dr. Alejandro Casas, who was a member of the research team. “They’re not attempting to produce one type of pitaya. 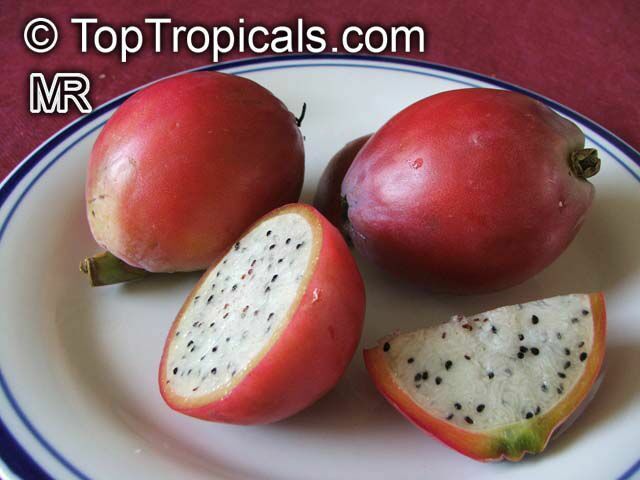 They have a rich understanding of the cacti and are able to produce fruits with a variety of colors and tastes,” adds the expert, which is an ethnobotanist. Pitaya are the fruit of cacti, and the main reason they were domesticated in prehistory in the first place. “We found that the forest cacti showed more diversity in their genes than expected. It is not a case of finding a simple transition from wild to domesticated plants,” the team member argues. “The methods of propagation of cacti by the traditional farmers, including the production of a variety of fruits, help increase the genetic diversity of the cacti. This is a crucial strategy in conserving the genetic resources of Mesoamerica,” he adds. Unfortunately they included a Ferocactus picture with the article. And we all know now that ferocactus fruit is small and not as delicious. Here’s the delicious desert pitaya, not to be confused with the jungle pitaya, also known as the dragon fruit, or the mountain pitaya, also known as the cactus apple.